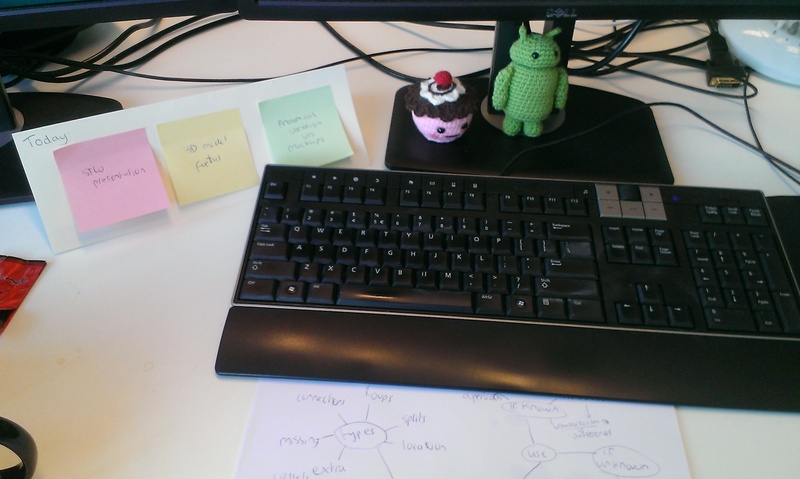 Post: Write the three selected tasks on post-its and place them in your view. I have a special ‘Today’ folded A4 to place them on. Complete: Start working on them one by one and as you complete them take them off the ‘Today’ board and throw them away. Be sure to also mark it as complete in your task manager. 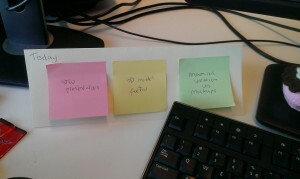 A close-up of the low-tech three tasks system consisting of a folded A4 sheet and three post-its. Yes, that middle one says ‘3D model foetus’…. In your task selection, be sure to browse your whole task list and be mindful of the urgency and importance of the tasks you select. No matter how big my task list is, I can typically do these three things and anything else I get done feels like bonus productivity. Restraining yourself to pick only three tasks helps you focus and keeps the context switching to a minimum. The physical ritual of writing these notes gets me into workmode fast and throwing them out after they are completed really feels rewarding to me (more rewarding than a click in a task manager somehow). If you find yourself doing things that are not on your post-its during the day, be aware that you are not focused on what you wanted to do today, so try and get back to it as soon as possible. Sometimes a task can be too big, if it is, split it into sub-tasks. Other times there were too many external interruptions so it will have to stay on the board for tomorrow. Don’t discard your task if you can’t complete it: it can only be replaced by sub-tasks or moved to tomorrow. I hope this is helpful to someone other than me as well ^^. What are the three things you want to get done today?